China’s top SOE regulator has urged giant companies to speed up structural reforms, asset reorganization and industrial upgrading progress to further compete with peers in global markets, according to a senior official. “The State-owned enterprises need to follow the supply-side structural reform as the guideline and accelerate the optimization of the State-owned assets,” said Bai Yingzi, director-general of enterprise reform bureau of the State-owned Assets Supervision and Administration Commission. Bai said SOEs must focus on their core business, increase their competitiveness by enhancing their innovation capability and upgrade their technology. The ongoing SOE reform has boosted the usage efficiency of Stated-owned assets and capital in key sectors. Stated-owned assets so far account for 80.1 percent in the country’s key sectors such as defense, power grid, petrol and petrochemical, transportation, telecommunication and energy. SASAC has been actively restructuring SOEs since last year, with the number of central SOEs falling to 98 after a merger between the country’s major power generator China Guodian Corporation and coal producer Shenhua Group on Aug 28, down sharply from the total of 196 in 2003. 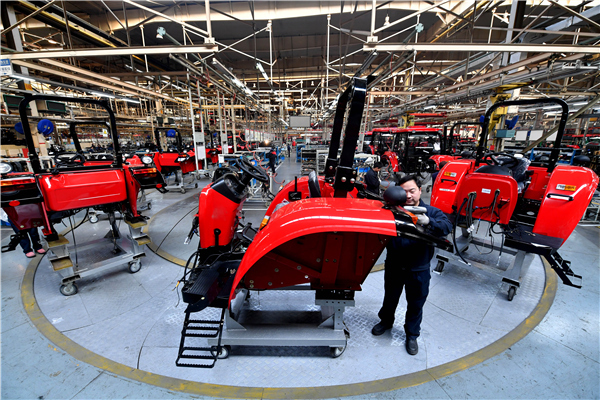 According to SASAC, the SOE reform has shown significant progress in structural optimization through cutting excessive production capacity and upgrading technology. Peng Huagang, deputy secretary-general of SASAC, said the key of SOE reform is much more than simply cutting down the number of SOEs and expanding their sizes. It also requires them to figure out a clear strategy and optimize the efficiency of Stated-owned asset allocation. “The final goal is to push SOEs becoming the world’s leading companies in both innovation and competitiveness through sharing resources, business integration and partnership,” Peng said. Zhao Ying, a researcher at the institute of industrial economics of the Chinese Academy of Social Sciences in Beijing, said SOEs played a key role in keeping the economy stable and sound. But SOEs will still have to go through a deepening reform progress, because of the tougher global competition and the transformation of the country’s economy. “The central government’s move will lower financing costs and optimize the industrial structure of the State-owned business, by using fewer bank loans,” Zhao said. “SOE reform is a very complicated process, requiring a greater ability to manage potential risks, and to build a State-private equity fund to help reduce SOEs’ debt ratio and improve their asset management,” he said. SASAC urged SOEs to spin off their subsidiary businesses to other companies that specialize in such sectors. For example, China Poly Group Corp, a real estate conglomerate, earlier this year spun off its 18.8 billion yuan ($2.85 billion) premium coal business to China National Coal Group.